With Clarkdale/Arrandale, Intel improved integrated graphics by a large enough margin that I can honestly say we were impressed with what Intel had done. 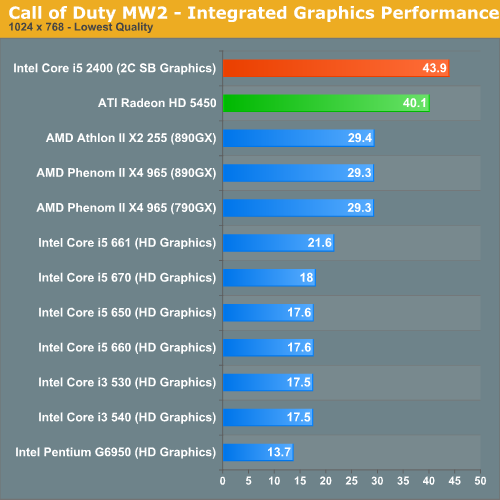 That being said, the performance of Intel's HD Graphics was honestly not enough. For years integrated graphics have been fast enough to run games like the Sims but not quick enough to play anything more taxing, at least not at reasonable quality settings. The 'dales made Intel competitive in the integrated graphics market, but they didn't change what we thought of integrated graphics. Sandy Bridge could be different. Architecturally, Sandy Bridge is a significant revision from what's internally referred to as Intel Gen graphics. While the past two generations of Intel integrated graphics have been a part of the Gen 5 series, Sandy brings the first Gen 6 graphics die to market. With a tremendous increase in IPC and a large L3 cache to partake in, Sandy Bridge's graphics is another significant move forward. It's unclear whether or not graphics turbo was working on the part I was testing. If it was, this is the best it'll be for the 6 EU parts. If it wasn't, things will be even faster. 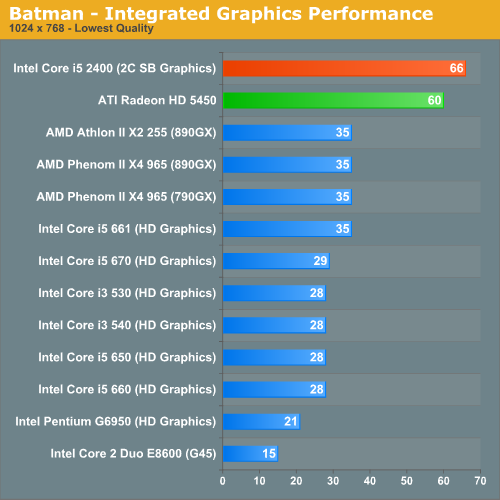 Comparisons to current integrated graphics solutions are almost worthless. 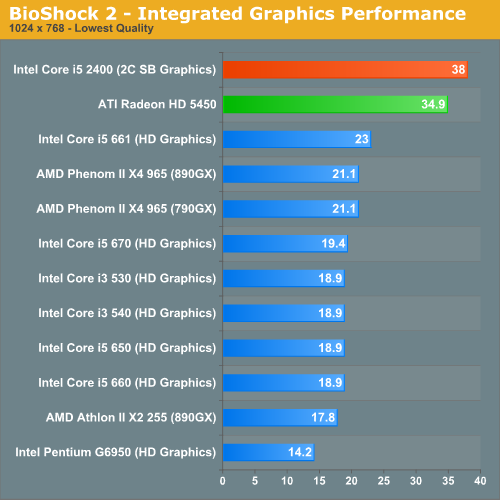 Sandy Bridge's graphics perform like a low end discrete part, not an integrated GPU. In this case, we're about 10% faster than a Radeon HD 5450. Assuming Sandy Bridge retains the same HTPC features that Clarkdale has, I'm not sure there's a reason for these low end discrete GPUs anymore. At least not unless they get significantly faster. Note that despite the early nature of the drivers, I didn't notice any rendering artifacts or image quality issues while testing Sandy Bridge's integrated graphics. 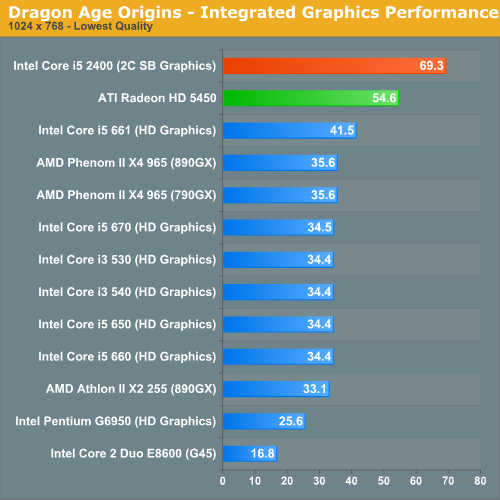 The Sandy Bridge advantage actually grows under Dragon Age. At these frame rates you can either enjoy smoother gameplay or actually up the resolution/quality settings to bring it back down to ~30 fps. It's not always a clear victory for Sandy Bridge. 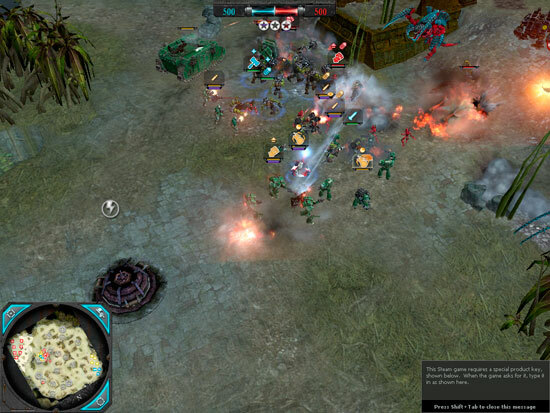 In our Dawn of War II test the 5450 pulls ahead, although by only a small margin. 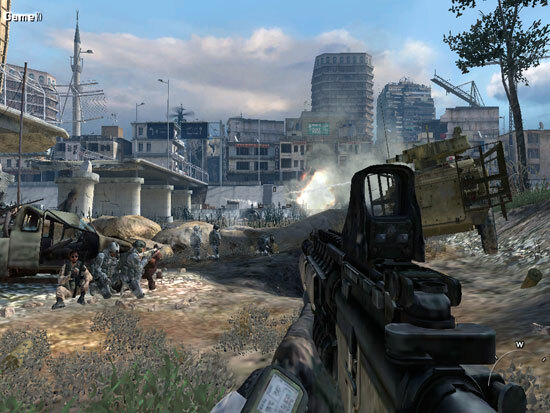 Sandy is one again on top of the 5450 in Modern Warfare 2. Although I'm not sure these frame rates are high enough to really up quality settings any more, they are at least smooth - which is more than I can say for the first gen HD Graphics. 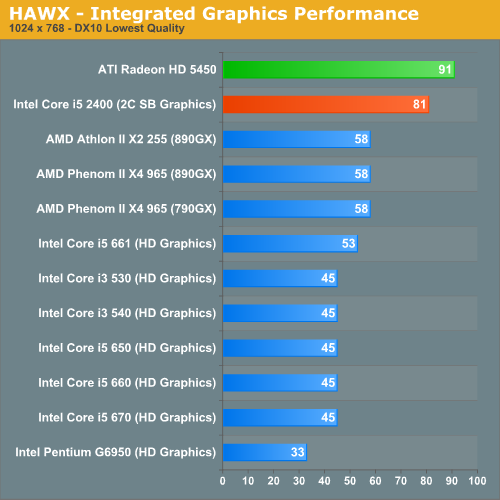 Intel promised to deliver a 2x improvement in integrated graphics performance with Sandy Bridge. 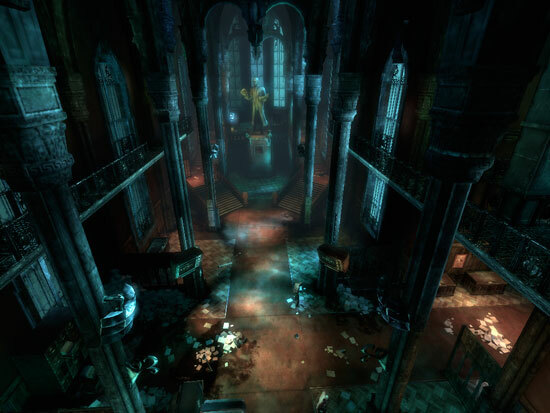 We're getting a bit more than that here in BioShock 2. 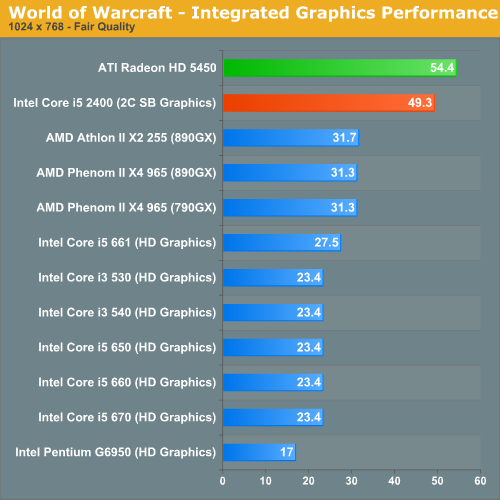 World of Warcraft is finally playable with Intel's Sandy Bridge graphics. The Radeon HD 5450 is 10% faster here. This is still a very early look. 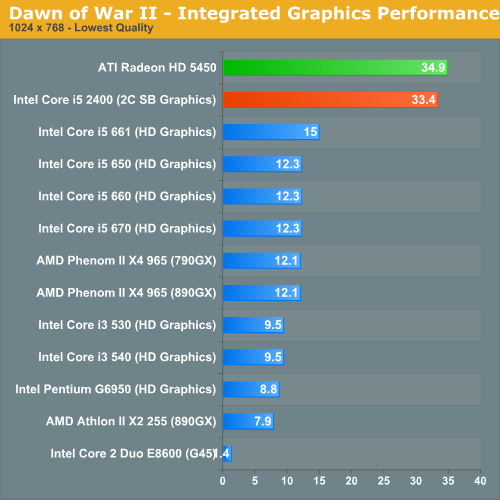 Drivers and hardware both aren't final, but the initial results are very promising. Sandy Bridge puts all current integrated graphics solutions to shame, and even looks to nip at the heels of low end discrete GPUs. For HTPC users, Clarkdale did a good enough job - but for light gaming there wasn't enough horsepower under the hood. 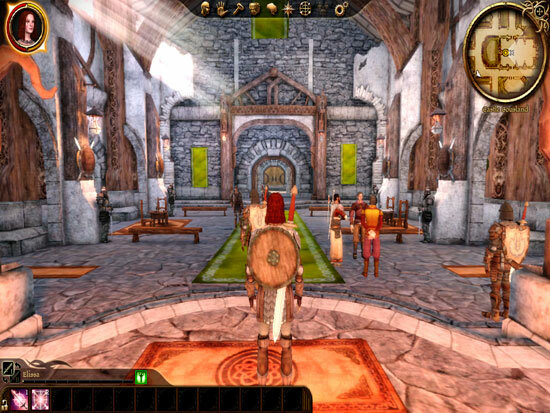 With Sandy Bridge you can actually play modern titles, albeit at low quality settings. If this is the low end of what to expect, I'm not sure we'll need more than integrated graphics for non-gaming specific notebooks. Update: It looks like all notebook Sandy Bridge parts, at least initially, will use the 12 EU IGPs. Our SB sample may also have been a 12 EU part, we're still awaiting confirmation.